Surgery, Furnace, Plumbing, Furnace, Plumbing - Monta Gael May, M.F.A. And a mindfulness practice helps in times like these. Updates in reverse chronological order. Last night Neil and I went over to the house to do a plumbing reconnaissance. We were looking at the pipes with exploded valves when Neil realized he heard spraying water coming from the main shutoff valve. It had a large split in it from freezing and was spraying a significant stream of water into the basement. Since this is the main shutoff, we had no way to turn it off. I called the water department — after hours — and was instructed that emergencies should be called into the non-911 police phone number. The police dispatcher said she would get the water department on the line for me. Luckily, the valve was good and easy to shut off. The guy told us that the line had been redone in 1994, which was why he knew where it was, why it turned easily, and why he only had to dig down 6-8 inches. He said the older ones were 3-6 feet underground, which would have required a backhoe to reach in the frozen ground. So the huge water leak is stopped for now. Unfortunately, city ordinances state that only a certified plumber can work on the main and water meter… so we have to hire a plumber to replace the valve and meter. And we still do not know if any other damage has occurred inside the walls. Antibiotics are seeming to work… less pain. No fever. Yea! I ended up back at the hospital clinic today with a major infection following the surgery. I’m on some heavy duty antibiotics while the culture they took grows. In a day or so I’ll know if they need to change my treatment. Meanwhile, last Friday the furnace at the old house gave out. It was the blower motor. We just happened to catch it when Wes went over to check on things prior to the deep freeze weather. The company we called was great to work with, and the guy worked until 9 or 10 pm to get us up and running. We checked it on Saturday and Monday and all was good. Unfortunately, on Tuesday or Wednesday, the blower assembly gave out again — not the motor, but the assembly itself. This time, we didn’t catch it until we went over last night. 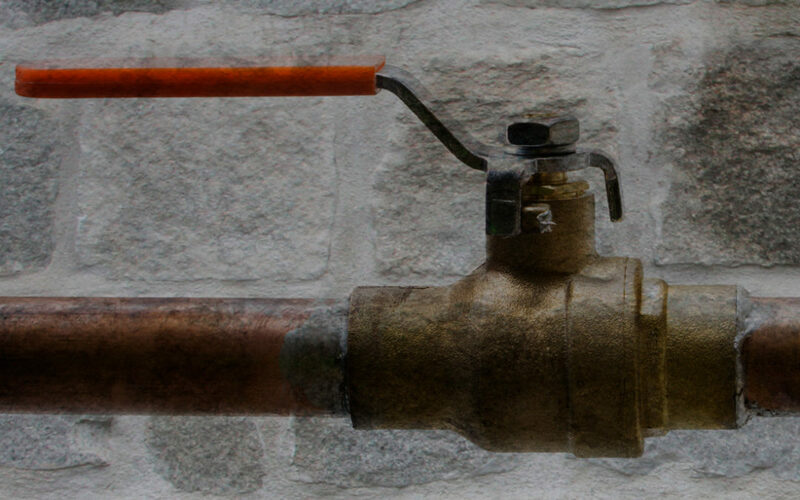 By that time all the faucets were frozen, the pipes in the basement had frozen and the plastic connector valves had blown apart. The basement floor was covered in ice. The main valve into the house was frozen so I had to heat it up a bit to get it thawed it enough to shut off all the water in the house. Our furnace guy came back over last night (Thursday), but could not get the part we needed until today. This morning, while Wes and I were at the clinic, he got the furnace running again. Right now the house is up to 48 degrees inside and the faucets have thawed. I’m hoping that the valves blowing saved the rest of the pipes, but we won’t know until I’m healed up enough to go over and work on things.